The heatwave continues in our neck of the woods, the perfect time to try this no cook summer dessert, suggested to me ages ago by my friend Amy. And what a winner! Each component is able to be purchased or made ahead of serving time with almost no fuss: all that needs to be done beforehand is to make the simple berry sauce and whip the cream – both of which just go straight back into the fridge until you’re ready for dessert. 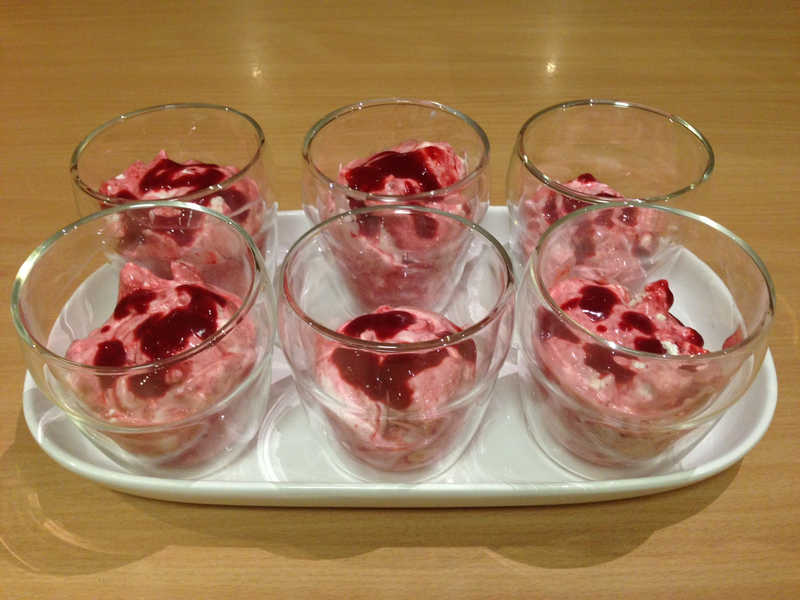 Not only are these individual possets of cool berry yumminess easy to make, all of the ingredients can be kept close at hand for dessert at short notice: frozen berries in freezer, packet meringues in the pantry, and cream and yoghurt are constants in my fridge. The recipe that follows is my adaptation of Valli Little’s, originally published in Delicious magazine, but do whatever you like with the ingredients: more or less of each item according to what you like to taste most of. The residents at my place have requested more meringue next time! Similarly, the yoghurt can be completely left out, just increase the amount of cream to replace it, which also lowers the cost a little. Using fresh strawberries and the quantities below, this recipe serves 6 and costs less than $10 to make. Assemble just before serving in whatever takes your fancy: tumblers, ramekins or martini glasses – whatever, and enjoy some stress free time with your guests. 1. In a small bowl add sugar to defrosted raspberries and mix through. Using a stick blender, puree the mixture and pass through a sieve and discard seeds. Add sliced strawberries to raspberry liquid and mix through. 2. In another bowl, whip cream, again using a stick blender. Just before serving, add crumpled meringues, yoghurt and berry mixture to the cream, gently combining each ingredient, but don’t over mix! 3. Divide mixture evenly among the six glasses and eat immediately.